We often get requests to find unique and one of a kind pieces for our brides...whether that be a garter, or a ring pillow, a hankie, etc. We search high and low to find beautiful pieces that we can recommend. 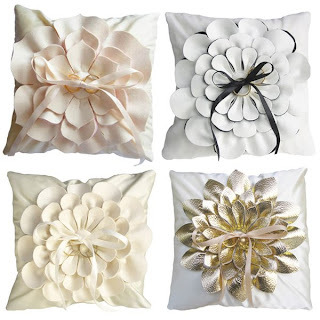 We recently found these stunning pillows from Anna Whitford. We love their architectural nature, but also their softness and elegance. (Images from Anna Whitford). This is what a ring pillow should be! These ring pillows are extraordinary!! !